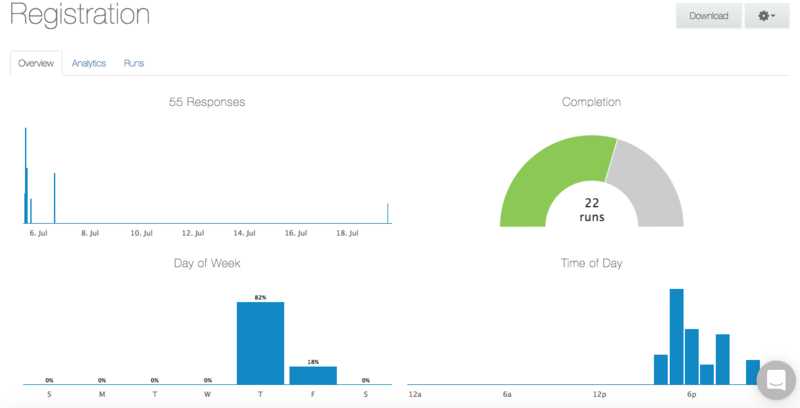 The results page will provide a 'Download' button in addition to an 'Overview', 'Analytics', and 'Runs' tab. In the 'Overview' tab, you'll see the number of responses in total that your flow has received, the completion rate of all runs, day of the week & time of day that messages were received. Within this tab, we break down the responses to your messages. In the example below, we see results for 'name', 'age', and 'gender' questions sent in the flow. You can search for and delete runs via the flow results page; simply hover over the run and click the 'X' icon that appears. Click here to see how to export your flow results.